We create the community of the casino card games fans. Every player has a possibility to choose a rival for playing and to communicate with him in online mode. Our friendly atmosphere will help you to relax and fully enjoy the game. Moreover, we suggest you a lot of useful information on Blackjack variations, strategies and bonuses to get familiar with. Please, do not hesitate to contact us in case you have any questions. Blackjack casino bonuses, reviews, tips. Also you can play blackjack online. Everybody's offering online Blackjack, but don't waste your time on most of them. You should select the best variation wisely. What Basic Blackjack Strategy does for you is not win the game every time, but come into every game with the same chances of winning. For instance, if the dealer showed a 6, you would stand, not hit, if you had 17. Both basic strategy and experience say that. Suppose, though, that the dealer then shows a 10 and reaches 20 by hitting with a 4. Hitting on the previous round would have given you a 21. You made a mistake, right? Wrong. Basic Blackjack Strategy isn't about winning against the odds all the time. It's about consistency. There's always a chance you might lose. Standing on a 17 versus a 6 is better than hitting. Period. Playing on hunches will only leave you losing more than you win. As a comparison, roulette has 18 red and 18 black spots. What if you were playing a variation of this, with just 17 blacks, and the same payout? As astounding as it may seem, you should play red every single time, not because you're guaranteed to be right, but because you have a greater overall chance. That is exactly how Basic Blackjack Strategy is. It is mathematically correct, and it has nothing to do with intuition. Who Came Up With Basic Blackjack Strategy? 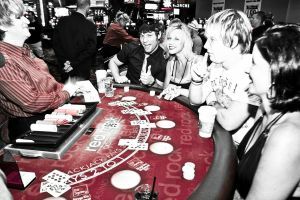 There are a lot of famous blackjack names which you probably have already heard. "Beat the Dealer," a book by Dr. Edward Thorp, was published in 1962 detailing the best Blackjack plays with simple charts. There are charts for different numbers of decks. They've changed some over the years, but they're basically the same, and they're published and distributed all over the globe. For just $1.50, most casino gift shops sell them, or you can get them online or out of a Blackjack book. Getting some Basic Blackjack Strategy charts is as easy as it gets, yet no one really bothers with them. Then, some of the people who do don't know how to use them the right way. A truly good blackjack player is one who both uses the charts and counts cards. It ticks me off when I play by the charts and then dealers want to tell me I don't know what I'm doing. I hit an A, 7 recently against a Las Vegas Club dealer's 10. I lost, and he felt the need to point out what he perceived as ignorant. I was right, though, and I bet I wasn't the first not to tip the guy. I asked a Main Street Station dealer if she was familiar with Basic Blackjack Strategy, and she acted like I had said something very general. It is in fact a specific term referring to Thorp's charts, and has been for decades. It seems unbelievable that so many people would willingly pass up the opportunity to improve their statistics, but they do. This is your big break, though. Going up against a bunch of people who don't believe in Basic Blackjack Strategy, you can be confident in the same.